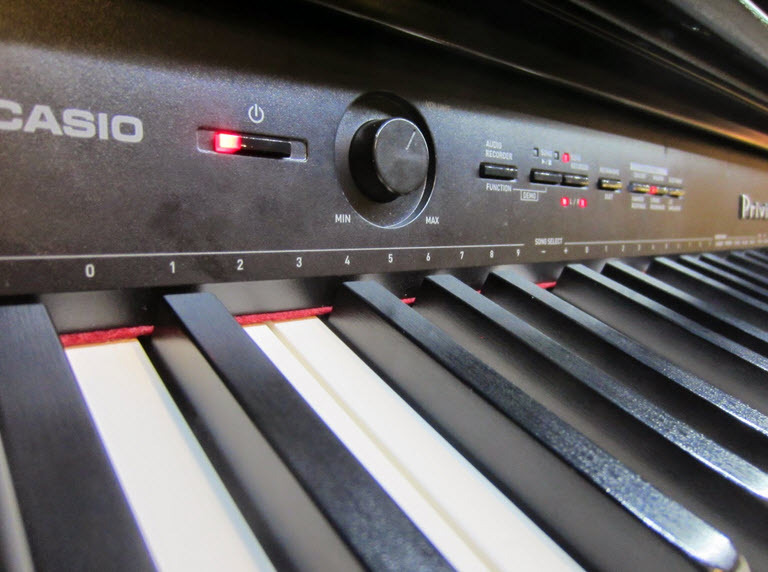 If you’ve seen this Casio PX850 digital piano, you’ll understand why many people go crazy over it. Its elegant looks, compact design, and unique features like the sliding key cover, duet mode, and track recorder are just some of Casio px850 the reasons why it’s so irresistible. The piano sound of this Casio Privia has undergone significant improvement. The piano uses over three times the memory of its predecessors, to give a piano tone that’s more natural. Additionally, the new sound source processor by Casio called Acoustic and intelligent Resonator (AiR), offers excellent, flawless dynamics for that powerful and expressive performance. The AiR processor uses grand piano samples recorded at four dynamics sampling, which enables it to produce grand piano sounds, which have long natural decays. The Casio PX850 comes with an 88-key, tri-sensor, and hammer action keyboard with a stylish slide cover. It also has textured ebony and ivory keys, which give an incredible feeling when touched. Its three sensors help to capture the dynamics of your performance with unrivaled accuracy and speed. Don’t forget to check this amazing review of Casio Privia PX-160. The Casio PX850 contains numerous other features that will surely make you delighted whether you’re a newbie or a professional. For instance, the 18 different tones and the 256 polyphony notes (many digital pianos have 128 or less), all of which are just impressive. The high polyphony makes sure that each note you play rings for the intended duration. Also, it has 20W dual speakers, which helps to enhance the piano’s sound quality further. The capacity of the speakers is also boosted by the adjustable cabinet, which directs the produced sound towards the performer. The matching stand, pedal board and keyboard cover of this piano make it an attractive addition to your home décor. It also has three built-in pedals, which allow for adjustments during a performance. For digital effects, this Casio PX850 is equipped with four chorus types, four reverb types, as well as brilliance levels which range from -3 to +3. It also has recording capability for two tracks and a song, which allows you to record and playback your songs. Casio PriviaProduces amazing sound that’s far much better than that of pricier models. Its rich tones are comparable to a grand piano; in fact, you wouldn’t notice any difference. The keys are perfectly weighted, and they feel very real. With this piano, you need not worry about the plastic feel that some digital pianos have, as the lower keys are a bit heavy compared to the higher ones, pretty much similar to a grand piano. The touch response is great considering the price of this piano, though not the best. If you want a better touch and key action response, you may need to spend more. This is one reason why this piano is best suited for beginners and transitional pianists. It’s a classy and attractive addition to any room. It also gives an impression of fine taste and sophistication to anyone who owns it. It’s easy to assemble. So long as you can read and follow the instructions included in the manual, you won’t find any problems assembling it. Just an hour or less is sufficient. Have excellent connection capabilities, just like its predecessors. Its simple stand design makes it quite portable. Doesn’t occupy too much space. Its sliding cover comes in handy for protecting the keys against spills and dust. It has incredible features that help to enhance the learning experience of beginners such as recording capability, inbuilt metronome, tempo settings, as well as preset songs. If you’re used to digital pianos with LCD, then you may get disappointed by the Casio PX850 because it lacks this feature. The material used for enclosing the keyboard is made of synthetic wood. This is a minor issue, but this piano would have been much better if the real wood was used instead. You also have to buy the matching bench separately when buying this Casio digital piano. 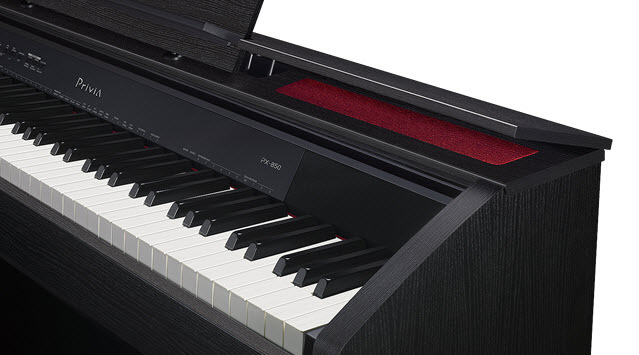 Considering the top-notch sound quality produced by the Casio Privia PX850, its price, as well the unique features it has, like the sliding key cover and the AiR sound processor, it’s a must-have instrument if you value quality. It’s most suitable for you if you’re a new learner or an intermediate pianist.